Our mission to touch the Sun is on its way … Administrator Bridenstine visits NASA spaceflight facilities … and an update on our first-ever asteroid sample return mission … a few of the stories to tell you about – This Week at NASA! Our Parker Solar Probe is on its way to touch the Sun. The spacecraft launched Aug. 12 at 3:31 a.m. EDT, aboard a United Launch Alliance Delta IV Heavy rocket from Cape Canaveral Air Force Station, in Florida. The mission could help improve forecasts of space weather events, which have the potential to damage satellites, harm astronauts in space, disrupt radio communications, and even overwhelm power grids. Our Administrator Jim Bridenstine visited three NASA centers playing pivotal roles in sending American astronauts back to the Moon and eventually to Mars. On Aug. 13, he met employees at our Michoud Assembly Facility in New Orleans, who are working on construction of our Space Launch System rocket, or SLS and Orion spacecraft that will fly astronauts on missions to the Moon and beyond. The test was the first in another series of evaluations for the developmental engine. SLS will use four RS-25s to launch Orion on missions to deep space destinations, including the Moon and Mars. And on Aug. 15, Bridenstine was at our Marshall Space Flight Center, in Huntsville, Alabama. While there, he toured facilities and was briefed on critical structural tests underway with SLS, as well as human spaceflight testing and science operations aboard the space station. On Aug. 17, OSIRIS-REx, our first-ever asteroid sample return mission reached another milestone. According to the University of Arizona – which leads the mission’s science team, observation planning and processing, the spacecraft began its final approach phase toward asteroid Bennu. It will arrive at Bennu later in December and return a sample from the asteroid in Sept. 2023. Bennu is rich in carbon and composed of primitive material from the beginnings of our solar system. 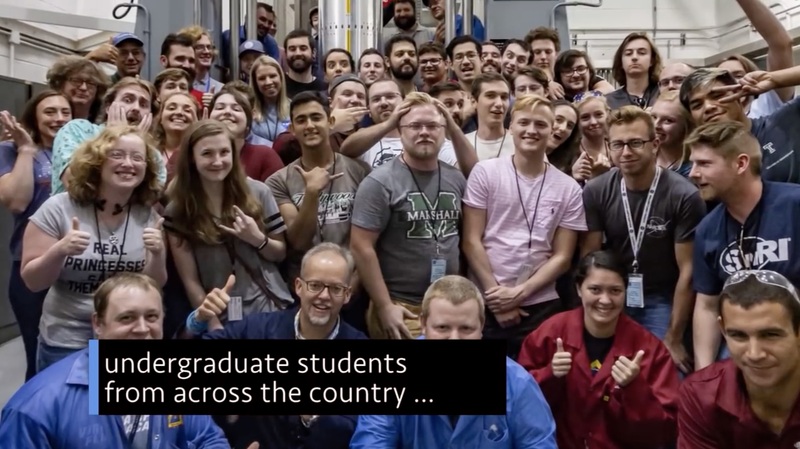 On Aug. 14, at our Wallops Flight Facility in Virginia, a suborbital sounding rocket carried eight student experiments on a brief ride into space. The experiments – developed by undergraduate students from across the country, flew through our RockSat-X program. They traveled to an altitude of about 98.5 miles before descending to a parachute landing in the Atlantic Ocean, about 64 miles from the launch site. During an Aug. 15 spacewalk outside the International Space Station, Russian cosmonauts Oleg Artemyev and Sergey Prokopyev performed work to deploy several technology demonstration satellites and install equipment for an environmental experiment to monitor the migration of groups of animals on Earth. It was the 212th spacewalk in support of space station assembly, maintenance and upgrades.